Customers today expect – and demand – a seamless and relevant experience. They have grown accustomed to marketers’ knowledge of their preferences and anticipation of their needs. Fractured or conflicting messages from a brand make marketers seem unorganised and annoy customers, sometimes even driving them away. As a result data-driven marketing has doubled over the last 12 months as marketers increasingly make one-to-one customer engagement their top priority. 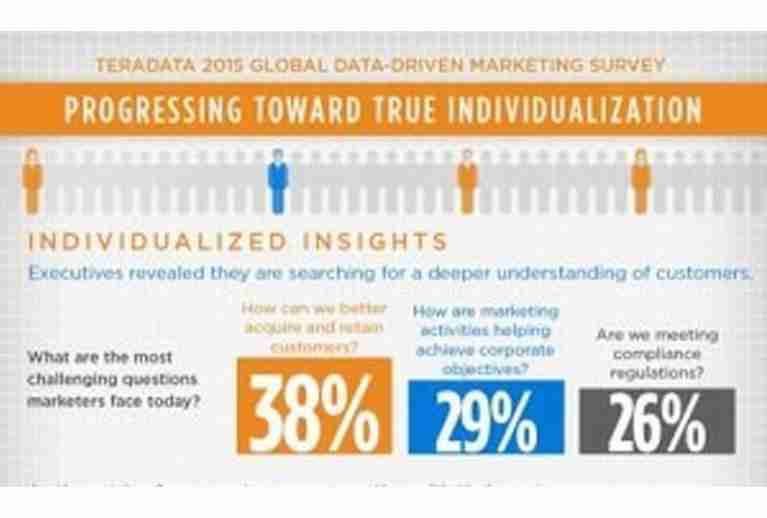 The Teradata 2015 Global Data-Driven Marketing Survey (an international study into trends surrounding data-driven marketing adoption and enterprise business value) reveals dramatic shifts in how companies and marketers are deriving business value from data, integrated marketing platforms, and customer-centric data-driven marketing strategies. 90% of marketers say making marketing individualised is a priority. They want to move beyond segmentation to true one-to-one personalisation in a real-time context. Faster, more accurate decisions are key benefits of using data for nearly two-thirds of respondents. 38% say their biggest challenge is improving customer acquisition and retention. Marketers’ second-biggest challenge is proving support of corporate objectives (29%) and meeting regulatory compliance was third (26%). Marketers have more than doubled their use of data-driven marketing in the past 18 months. 78% of marketers now use data systematically, versus 36% in 2013. Data-driven marketing is viewed as the means to the end of gaining individualised insights, and integrated marketing platforms like the Teradata Integrated Marketing Cloud are in high demand. Marketers however still struggle with individualising offers and communication. Only 50% routinely apply data to engage consumers. 44% admit a lack of consistency in omni-channel marketing. And 80% say that silos within Marketing prevent them from knowing how campaigns are performing across different channels. 43% of marketers say they now control their company’s customer data (up from 34% in 2013). And a vast majority (83%) say they take an omni-channel approach to reaching customers. 84% agree that making Marketing and IT into strategic partners is vital. 92% agree that integrating data across teams can improve customer service. Teradata’s research was conducted in late 2014 by Forbes Insights, which surveyed 1,506 marketers in enterprises around the world, across all industries. The 28-page survey and accompanying infographic are available at no cost from the Teradata website.